Please join us for an artist's reception on January 11, 6-9 p.m. at the Keystone Gallery. 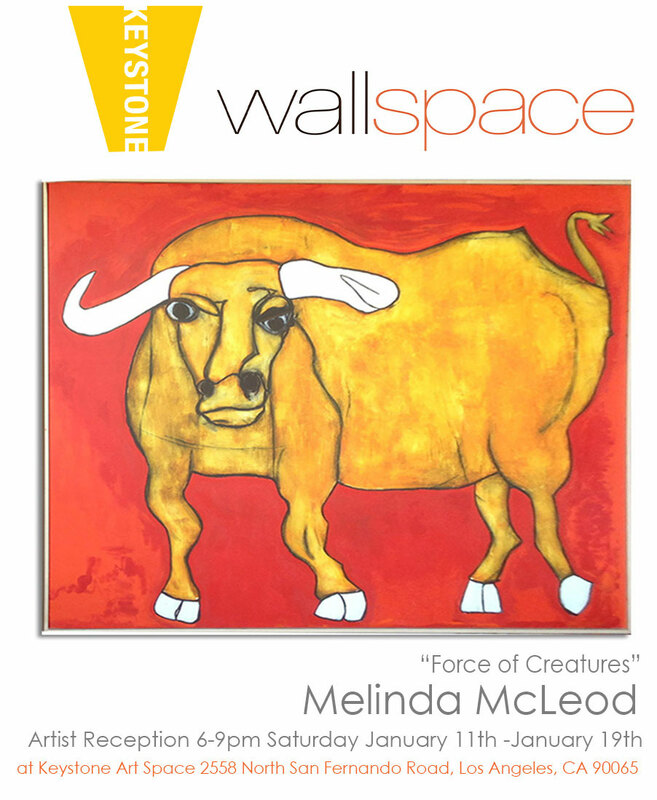 Wallspace and the Keystone Art Space are proud to present the solo show "Force of Creatures" by Melinda McLeod, with an artist reception January 11th 2014. Melinda McLeod's "Force of Creatures" paintings are inspired by living creatures. Melinda developed her own unique style and technique, ultimately using sizable canvases to create bold and vibrant expressionistic paintings. She begins with charcoal sketches of animals on paper. Unplanned and candid, these images of bulls, horses, pigs, dogs and people embody the animal's natural spirit. Their still, vulnerable eyes glow from within, reflecting their souls. Melinda studied drawing and painting at UCLA and USC in Los Angeles. Her paintings are collected by both corporate and private individuals, nationally and internationally. Melinda lives and works with her family and a small collection of creatures in the city of Los Angeles, California. This is her first Los Angeles solo show - a co-production of Wallspace and Keystone Art Space. "My goal in opening the gallery space was to give as many emerging and established Los Angeles artists as possible the opportunity to be seen but also to create an environment where people can be comfortable with art,” says Valda Lake owner and founder of Wallspace. “This is a fantastic opportunity to feature Wallspace artists in the beautiful art space at Keystone, and I am very excited about our future collaborations with so much talent both at Keystone and also at Wallspace."